This is an Indian sweet recipe, which is, mainly prepared in Northern part of Karnataka (India). This is one of the Diwali sweets. Basically, “Puthani”is a kannada word, which is used for “Pholay chane” or “Roasted bengal gram” in Northern part of Karnataka. This dish is prepared from Roasted Bengal gram and sugar. Amongst all the sweets, this is the most healthy and tasty one. At the same time, this is very less expensive as well! This dish does not require ghee (clarified butter) or oil for preparation. Persons, who are health and weight conscious, can have this sweet dish without restrictions. Roasted Bengal grams are healthy as they contain many nutritional elements which are necessary for the proper growth of our body. They contain many vital vitamins. You will be happy to know that the procedure for preparing this dish is simple one and less time consuming. Let’s see the preparation of Puthani Burfi. 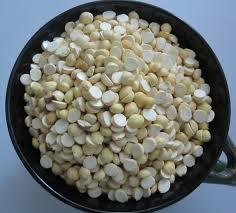 Clean the Puthani/Puffed bengal gram and grind it into fine powder with the help of mixer grinder. Sieve the grounded flour with the help of fine mesh flour filter. Keep it in a bowl. Take a plate and grease it with a drop of ghee and keep it aside. Pour sugar and ¾ cup of water ( around 100 ml) to a wide mouthed pan and place it on medium flame. Stir it continuously so that sugar will dissolve fast. After sugar dissolved completely, make the flame low. Let the syrup boil for 5 minutes so that big bubbles should appear on the surface of the syrup. Further boil it for another 5 minutes. Remove from the heat. this is called one string syrup. Add the flour, cardamom powder and half of the grated dry coconut powder to the syrup. Mix them well with help of a spoon. Pour the mixture to the greased plate and spread it evenly all over the plate by just patting the plate. Sprinkle poppy seeds and remaining grated coconut over it evenly and leave it cool down for 15 – 20 minutes. If you want you can spread chopped dry fruits over it. After 15 minutes, cut them into square shape or any shape you want. Healthy and tasty Puthani burfi is ready to serve. You can store in a air tight bottle for more than a month. Isn’t cooking interesting!